Just 4 minutes’ walk from the beach, the H10 Delfin – Adults Only is a contemporary hotel near Salou’s Levante Beach. An ideal place for a couples' getaway, this adults’ only hotel has an outdoor pool with fountain and sun terrace, rooftop plunge pool, surrounded by sun loungers, a gym, poolside snack bar, lobby bar and the Blancafort buffet restaurant. Each room is colourful but tasteful, and has air conditioning, satellite TV and a private bathroom as standard. Featured amenities include wired Internet access (surcharge), a business center, and a 24-hour front desk. Free self parking is available onsite. A 10-minute walk from the beach, the H10 Salauris Palace is also close to the PortAventura and Ferrari Land theme parks. Ideal for families, the hotel has a lagoon-style outdoor pool with waterfall and hot tub, heated indoor pool, gym with Turkish bath and sauna, buffet restaurant, poolside snack bar and an all-ages entertainment programme. All rooms are air conditioned and have safes, and TVs with international channels. The modern 4-star Ohtels Villa Romana is located only 300 metres way from Levante Beach. Guests can enjoy themed dinners and varied show cooking, swimming pools, jacuzzis, solariums and an extensive entertainment programme with water events and a variety of activities. The smartly decorated rooms feature TVs and free amenities. Found in the heart of Salou, the contemporary 4-star Hotel Regente Aragon is just minutes’ walk from the 2 main beaches of the Nautical Club. The hotel offers two modern dining options – pinxtos by the bar, and the innovative Cook&Travel which serves gourmet takes on world cuisine, complimented by immersive artistic projections. Rooms are air conditioned and have LCD TVS, desks, free safes and wi-fi access. At Santa Monica Playa, enjoy a satisfying meal at the restaurant. Quench your thirst with your favorite drink at the bar/lounge. Buffet breakfasts are available for a fee. 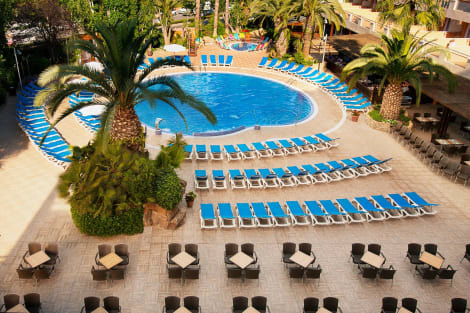 A modern hotel in one of the most relaxed areas of Salou, the Hotel California Palace is just a few metres from the train station and within walking distance of the Llevant and Ponent beaches. 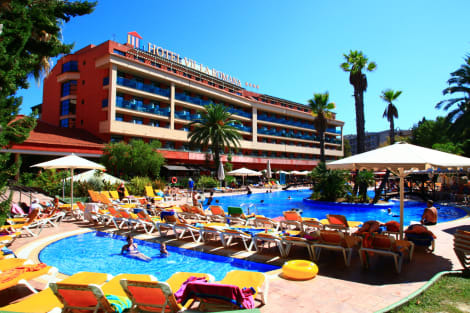 The hotel has a wide variety of facilities at your disposal, including a 24-hour reception, buffet restaurant, bar, adults and children’s pools and free wi-fi. Rooms offer modern comforts like satellite TV and air conditioning. This property is 3 minutes walk from the beach. 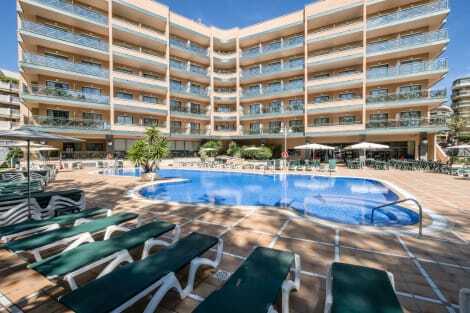 Located 200 m. from Cap Salou Beach, H10 Mediterranean Village offers views of the Costa Dorada. It features 2 outdoor swimming pools, apartments and rooms with private balconies. H10 Mediterranean Village also includes an indoor swimming pool, a children´s pool, fitness centre, Turkish baths and a sauna. There are also hot tubs on the upper terrace of the hotel. Les Oliveres buffet restaurant features show cooking and a children´s buffet, while La Terraza snack bar can be found near the pool. The complex also has a pizzeria, Il Forno, á la carte restaurant, La Masia and a supermarket. The hotel offers a children´s entertainment programme and a playground. 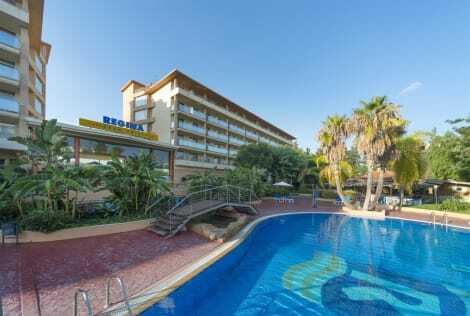 The Regina Gran Hotel is located 200 m from downtown Salou. The hotel has 294 bedrooms. Standard rooms, junior suites or suites are available, all of them with a large balcony and air conditioning, heating, complete bathroom with hairdryer, satellite English TV with music, telephone, safe and fridge (optional). Internet’s area. Restaurant (buffet service with "show cooking"). Swimming pools for adults and children. Fitness area "Regium", heated swimming pool, saunas, etc. Paddle and sport pitch. Mini-golf, entertainment area. Snack bar, Pub. Car park (optional). Children’s playground, mini-club, access for disabled guests plus day and night entertainment. Stay in one of 497 guestrooms featuring flat-screen televisions. Rooms have private balconies or patios. Complimentary wireless Internet access keeps you connected, and satellite programming is available for your entertainment. Private bathrooms with bathtubs or showers feature complimentary toiletries and hair dryers. The H10 Vintage Salou is just 7 minutes’ walk from the Llevant beach and 1.5km from PortAventura theme park. Perfect for relaxing, the hotel’s facilities include Despacio Beauty Centre, Les Vinyes restaurant, which offers buffet meals and show cooking, a cocktail bar, pool and terrace, an evening entertainment programme with live music, cyclist station and an adults-only rooftop terrace with plunge pool. The hotel’s rooms all have air conditioning, balconies, flat-screen TVs and private bathrooms. Make yourself at home in one of the 30 air-conditioned rooms featuring kitchens with refrigerators and stovetops. Your bed comes with down comforters, and all rooms are furnished with double sofa beds. Rooms have private furnished balconies. Complimentary wireless Internet access is available to keep you connected. Make yourself comfortable in this air-conditioned apartment, featuring a kitchen with a full-sized refrigerator/freezer and an oven. Wireless Internet access (surcharge) is available to keep you connected. Conveniences include a microwave and a washing machine, and you can also request a crib/infant bed (surcharge). Make yourself at home in one of the 390 air-conditioned rooms featuring refrigerators. Rooms have private balconies. Complimentary wireless Internet access keeps you connected, and satellite programming is available for your entertainment. Bathrooms with bathtubs or showers are provided. 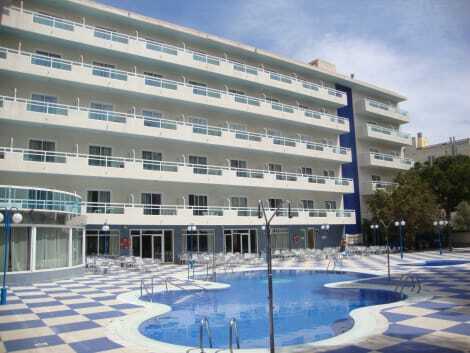 Situated 550m from the beach, 2.5km from Salou center, 5km from a theme park and 12km from Reus airport. 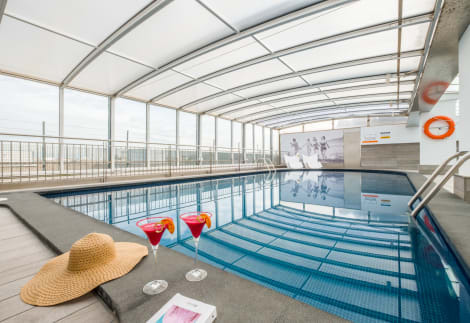 Facilities and services include restaurant, bar, garden, outdoor swimming pool, indoor heated pool, mini-golf, wireless Internet in public areas, elevator and 24-hour reception. The rooms feature TV, telephone, safe, hairdryer and balcony/terrace. ** Please note that some of the above facilities may be closed due to weather / seasonal conditions. Address: C/ Fra Juniper Serra s/n, 43840 Salou, Tarragona, Spain. Take advantage of recreation opportunities such as an outdoor pool or take in the view from a terrace and a garden. Additional amenities at this aparthotel include complimentary wireless Internet access, an arcade/game room, and tour/ticket assistance. Salou, one of Spain's most family friendly holiday destinations, was originally known as Salauris by the Greeks and is revered for its scenic promenade, the Passeig Jaume I. Like many other Mediterranean resorts, it overlooks a fantastic sandy beach and attracts large numbers of golfing enthusiasts thanks to its popular Lumine Golf Club. Opened in 1995, the PortAventura theme park welcomes millions of visitors annually and is one of the leading family attractions in the country. The park comprises several mini-theme parks with continental and national themes, and is famed for its Hurakan Condor ride, a formidable 330-foot drop tower that is perfect for people seeking an adrenaline rush. The birthplace of one of the most iconic and influential architects in history, Antoni Gaudí, Reus also has earned an enviable reputation for its exceptional wines. The Baix Camp capital contains many noSEOSITE_LEVEL_DESCRIPTION Catalan modernist landmarks, one of the most intriguing of which is the Casa Gasull, which was built in 1910 and was designed by another eminent architect, Lluís Domènech i Montaner. The main place of interest in this picturesque coastal community is the Roman amphitheatre of Tarraco, which is one of the finest preserved ancient landmarks in the country and was part of a strategic Roman city. The site is now protected as a UNESCO World Heritage Site, which also includes a large Roman aqueduct, a Provincial Forum, and several other preserved monuments. If you have the time, you might want to consider taking a day trip to Barcelona to see some of the city's fascinating Gaudí masterpieces and world-class museums such as the Barcelona Museum of Contemporary Art or the Museu Picasso. Visit the magnificent fountain of Montjuïc at night, explore the enchanting Sagrada Família church, see the city's Gothic Quarter, and immerse yourself in the Middle Ages. For outstanding live music performances, head to the Palau de la Música Catalana, or wander along the famous shopping street of Las Ramblas to buy some luxury souvenirs. For some delicious international-themed dishes, you can dine at the Lindas Bar,or head to Olivers Restaurant for some delecSEOSITE_LEVEL_DESCRIPTION steaks and other tasty international recipes. La Venus de Pepe, meanwhile, provides tempting Italian and Mediterranean cuisine, while the Gabers Grill is the place to be if you're looking for some mouthwatering British-themed classics. For luxury surroundings and deluxe accommodation, book a room at the PortAventura Hotel Caribe, or choose the affordable, beautifully landscaped H10 Mediterranean Village. 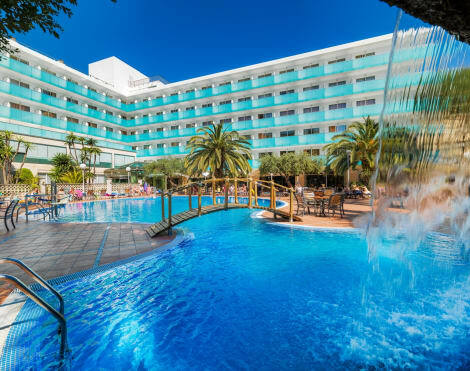 A few other reputed Salou hotels to consider include the MedPlaya Hotel Calypso, the 4R Playa Park Hotel, and the Sol Costa Daurada.